Sixty-five striking Port Arthur Health Centre workers and other supporters held a rally at the Thunder Bay, Ont., clinic Wednesday morning. By afternoon, both sides were in a courtroom for an injunction hearing. 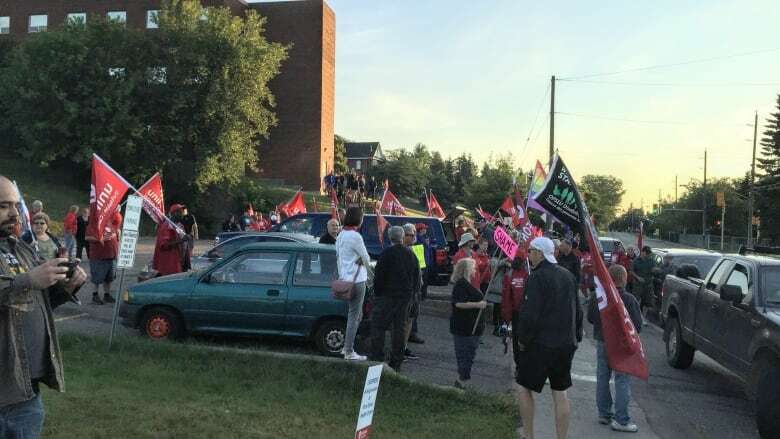 The Port Arthur Health Centre in Thunder Bay, Ont., was effectively shut down Wednesday as 65 striking workers and a few hundred other supporters held a rally at the northwestern Ontario clinic. The job action also prompted clinic administrators to seek a court injunction Wednesday afternoon to limit the strikers' picketing and curtail their ability to prevent access to the health centre and the property. The proceedings heard oral evidence from the clinic on Wednesday, while Unifor, the union representing the striking workers, was then expected to make submissions. The matter was scheduled to return to court Friday afternoon. Over 200 people gathered Wednesday morning to support the workers with flags and signs in-hand. The crowd prevented doctors and other clinic staff — including CEO John Marrello —from entering the building. Thunder Bay police and private security were also on-site to keep an eye on the rally. "We put a call out and our members really respond well to when we ask them to do something," Katha Fortier, the assistant to Unifor's national president said of the turnout. "It's great, I know the women on the line feel incredibly supported to have this here." In arguing for the injunction, legal counsel for the health centre said that Wednesday's rally went beyond peaceful picketing, that no strike protocol was in place, and that picketing laws were not being followed. Lawyers for Unifor said they were willing to sit down with the other parties and draft a protocol and that they'd be able to fully respond Thursday. The union's counsel did say they wanted the court to tell both sides to establish a picketing protocol and to re-start bargaining discussions. Justice Pierce said, during the hearing, that it would be better if both sides get together and starting talking about all outstanding issues. The rally on Wednesday included supporters from communities outside Thunder Bay, like Sudbury, Kitchener and Goderich, and others from outside the province. The strike, which includes employees who work as medical aides, appointment secretaries and medical records workers, began April 9. Over the weekend, Unifor Local 229 — which represents the striking workers — asked Thunder Bay residents to find alternative health care services. The clinic is located on Court Street in Thunder Bay. No talks have been scheduled between the union and the clinic's management in months, Unifor said. The union has said that low wages and a lack of job security for workers are key issues in the labour dispute. The union said the last day of contract negotiations was April 4. "This isn't something we do lightly," Fortier said of forcing the clinic's shutdown. "If this employer would talk to us, if this employer would meet with us and bargain as they're supposed to do, as they're legally required to do ... this is rare." "They hold the power," she added. "We want to negotiate ... we have a party on the other side that refuses." Port Arthur Health Centre staff vote for strike action in Thunder Bay, Ont. CBC News attempted to get comment from clinic representatives, including Marrello, one of the physicians and other staff, at Wednesday's rally, but officials turned away, shaking their heads indicating "no," when approached by a reporter. The health centre's manager of human resources and operations told CBC News on Tuesday that patients shouldn't have to be caught in the middle of the dispute and that they shouldn't have to put their health care "on hold due to personal gain." Fortier said that the union has brought the dispute to the Ontario Labour Relations Board, charging the clinic with bargaining in bad faith. A hearing is scheduled for mid-August, Unifor said. Since that issue had yet to be dealt with prior to the escalation in picketing, lawyers for the health centre argued during Wednesday's injunction hearing that the rally was "high-handed and preposterous." 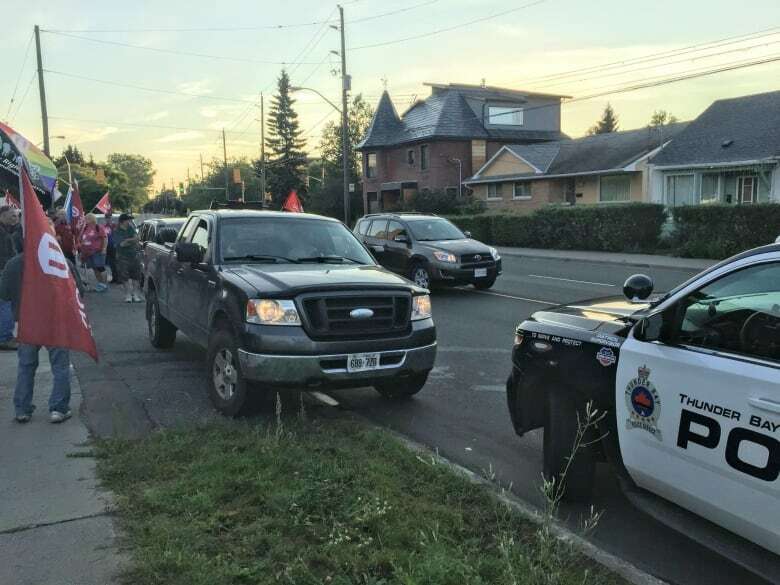 Unifor officials also told CBC News at the rally that Thunder Bay police were considering mischief charges against local union representatives because of the rally. When asked if any charges had been laid Wednesday afternoon, Insp. Derek West said that police are investigating and "reviewing all options." "Our role is not to take sides but keep the peace and encourage cooperation by all," he said. "They (the strikers) need to return to lawful picketing that they can do, where it still allows people to come and go from the property, and carry on business while they are [getting] their message across." "Currently that's not what's going on." West said that picketers also have to identify strike captains.